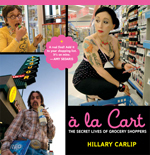 A la Cart: The Secret Lives of Grocery Shoppers. Mar. 2008. 120p. illus. Virgin, $17.95 (9781905264179). 818. 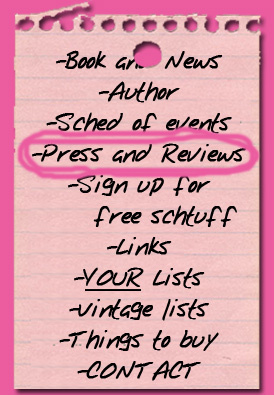 First published March 15, 2008 (Booklist). Carlip, the self-described queen of the oddballs (from the title of her acclaimed memoir), draws on her love of story, passion for performance and transformation, eye for found art, and gift for comedic and empathic improvisation in a unique portrait gallery. A populist Cindy Sherman, an American Tracey Ullman, a female Eddie Murphy, and a disciple of Lily Tomlin, Carlip used her quirky collection of discarded shopping lists as inspiration for 26 characters, assuming the identity of men and women shoppers of various ages, backgrounds, and preoccupations. YA/M: YAs will find Carlips amazing transformations, intriguing characters, and mix of irreverence and compassion hugely entertaining. DS.